We met some of the sweetest staff ever, and we were able to start immediately going around to all the rooms to play our music for the people there. We dropped off some clothes. The man holding the vest was coordinating the business of the evacuation center the day that we visited, and as we were about to leave we asked for his namecard. He was very sorry and said he didn't have one to give us. "I also don't have an address anymore because of this disaster..."
There weren't many children, but the older people were so happy and lively, it was a huge treat to be able to meet them and talk with them. 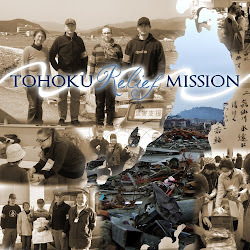 One woman who had lost everything in the tsunami, told us, "When I went back to my house, and saw that it was a pile of rubble, I had no reaction. I didn't know how to feel; I just stood there and stared at it. It's been three weeks and I haven't cried at all. Listening to you sing today, I cried for the first time." This man could barely move, but he made an effort to stand up and show me his rose. He really wanted to show me this rose, and it was one of his most sacred possessions. I'm not sure if he got it while he was in the evacuation center or not, but he was holding it and looking at it so lovingly, and wanted me to look at it too. He said, "This pot fell down in the earthquake last night [the earthquake was a 7.3 off the coast of Miyagi]. But I picked it up and put it back in its pot, and it's still alive. It's still as beautiful as ever, and it will grow even bigger." And then he cried. Most of the electricity was cut because of the earthquake the night before. There was another huge rush on the convenience stores. The shelves were completely empty, and signs like this were everywhere. On the way back we had a look at some of the devastation along the Ishinomaki coast. It was a strangely different effect than Kesennuma or Minamisanriku, both of which were port inlets that tapered to a point, where the wave entered and just plowed through everything across a wide space. In Ishinomaki, the tsunami hit straight across a longer stretch of coast, but didn't seem to make it so far or so forcefully inland. Still, in some ways, while the houses weren't as completely desecrated, and from far away looked like they might still be standing, they were just skeletons of broken walls and windows. This was a few blocks in from the port--this boat and others like it resting on the road.